It’s an exciting time for prospect junkies across the globe as the NCAA Baseball Tournament kicks off in the weekend before the MLB draft. Here’s a look at how the top MLB Draft pitching prospects performed in the tournament’s opening day. Gerrit Cole – RHP – UCLA – Jr. 7.1IP 11H 3ER 1BB 11K. (L, 6-8). While Cole is a fantastic pro prospect, why the Bruins don’t consider fellow top 5 pick Trevor Bauer their ace is beyond me. Perhaps a loss to #4 seed San Francisco will teach them a lesson. Perhaps it’s too late. Sonny Gray – RHP – Vanderbilt – Jr. 6IP 3H 0ER 0BB 3K. (W, 11-3). Undersized RHP has been falling a bit on draft boards lately due to questions on whether he’ll start or relieve as a pro. Still one of my favorite prospects and likely top 15 pick. Matt Barnes – RHP – UConn – Jr. 4.1IP 9H 7ER 3BB 6K. (L, 11-4). Still a safe bet to go in the 1st. Erik Johnson – RHP – California – Jr. 2.1IP 3H 5ER 6BB 1K. (L, 6-4) Johnson, who should go in the first 3 rounds, is a big RHP who sits in the low 90’s with a plus slider and weak change. Weak outing against Logan Verrett and Baylor. Logan Verrett – RHP – Baylor – Jr. 7.1IP 7H 3ER 2BB 4K. (W, 7-5). Entered the season as a first round pick but struggled early. Has been great lately and could sneak into the 2nd round. More likely a 3rd rounder. Anthony Meo – RHP – Coastal Carolina – Jr. 6.1IP 9H 1ER 2BB 7K. Led #3 seed Coastal over #2 seed prospect laden Connecticut team. Meo could go in the first 50 picks. Matt Price – RHP – South Carolina – So. 1.2IP 0H 0ER 0BB 3K. (S, 16). Last year’s CWS hero is a likely top 5 round pick as a sophomore. Sam Stafford – LHP – Texas – Jr. 7IP 2H 1ER 3BB 6K. (W, 6-2). Stafford is considered a 5th/6th round talent by Baseball America. Mark Pope – RHP – Georgia Tech – Jr. 1.2IP 1H 0ER 1BB 0K. Pope has been great this season (11-4, 1.74 ERA, 5 CG) and could go in the first 5 rounds but left this game early with a back injury. Todd McInnis – RHP – Southern Mississippi – Sr. 9IP 7H 3ER 2BB 6K. (L, 8-3). Senior should come off the board between the 8th and 10th rounds. Carson Smith – RHP – Texas State – Jr. 9IP 8H 2ER 1BB 5K. Texas State would go on to lose this game to Kent State in 11 Innings. Smith should be picked in the first 5 rounds. Will Roberts – RHP – Virginia – Jr. 9IP 4H 0ER 0BB 14K. (W, 11-1). Masterful performance against Navy. Roberts is a 10th-15th round pick in my opinion. Mike Wright – RHP – East Carolina – Jr. 8IP 7H 2ER 4BB 5K. (L, 6-4). Baseball America considers Wright to be a 5th-6th round talent. Michael Roth – LHP – South Carolina – Jr. 7IP 2H 0ER 2BB 4K. (W, 12-3). Classic case of a great college pitcher who likely won’t be a high pick. 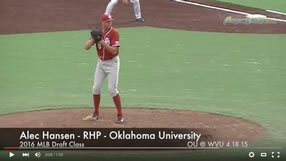 Michael Rocha – RHP – Oklahoma – Sr. 7.1IP 5H 1ER 1BB 3K. Undersized bad bodied should be picked after the first 10 rounds. Tyler Pill – RHP – Cal State Fullerton – Jr. 8IP 5H 4ER 3BB 11K. (W, 7-1). Pill, a two way threat, reminds me a little of former Michigan Wolverine Zach Putnam, a two way star in his own right. Pill will pitch as a professional as a pack of the rotation starter or a reliever. Kyle Hunter – LHP – Kansas State – Jr. 4IP 8H 5ER 0BB 2K. (L, 5-5). Hunter was a 43rd Round Pick last season (Yankees). Greg Gonzalez – RHP – Fresno State – Sr. 4.2IP 12H 5ER 2BB 3K. (L, 11-1) Likely draft pick but unclear where after his first bad start of the year. Tyler Ray – RHP – Troy – Jr. 7.2IP 8H 2ER 1BB 5K. (W, 12-0). Junior has been fantastic all season. I view him as a 10th to 15th round prospect.